The first week in May and there we were on our way to spend some time in sunny, southern California. We thought our weather troubles would be left behind. What we didn’t know is that in May the Los Angeles area is subject to a localized weather phenomenon called the Catalina Eddy<. This causes the chilly "May Gray" and "June gloom" that our hostess, Meg, told us has arrived like clockwork every May and June since they have lived there. Tuesday evening driving around the San Gabriel Mountains to the north of LA, on our way to Matt and Meg's North Hollywood neighborhood, we found ourselves driving from hot, sunny desert conditions into a cool, drizzly gray day. Meg assured us that it had been warm and sunny in the days preceding our visit. And the weatherman predicted that the cloudy weather would only last for a couple of days. But it still made us feel that we somehow manage to drag bad weather around with us wherever we travel. But, regardless of the weather conditions, we couldn't have had a warmer welcome by Matt and Meg. They weren't able to take time off from their jobs, but they were very gracious hosts, providing us with information as we explored on our own during the 3 days we were there. 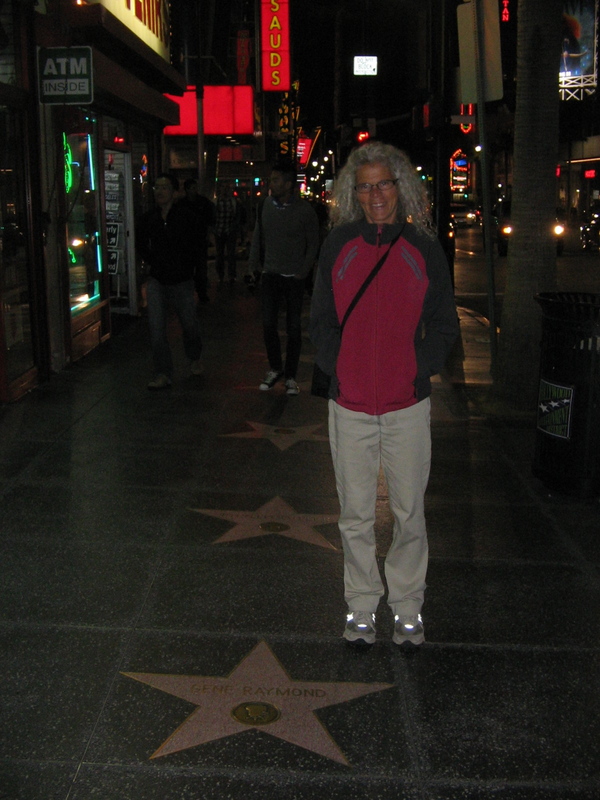 Wednesday evening Matt drove us to downtown Hollywood where we had dinner and strolled the "Walk of Fame." Walk of Fame in Hollywood. 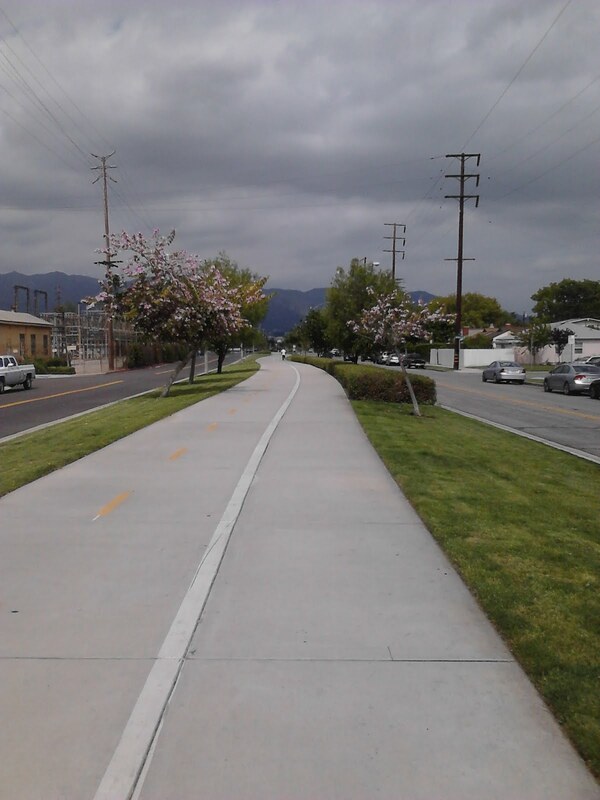 An afternoon bike ride in LA that included some miles on the Chandler Avenue Bike Path. Thursday and Friday we had the pleasure of visiting with Agnes, who had made the trip from Phoenix to spend several days at Matt and Meg’s. Friday after lunch we said our goodbyes to North Hollywood and continued our California travels. The Catalina Eddy effect had dissipated, leaving clear, sunny skies, although a bit on the cool side. Now that the sun was back we felt we shouldn’t leave LA and the coast without stopping by one of the beaches. Meg had given us directions to an area where we could walk the beach, but as we drove the highway in that direction we saw a sign warning of an accident and a road closure on the road that would take us to the beach. Lee had researched a state park further up the coast where we could camp for the night so we decided to skip the beach in LA, since we would be seeing a beach at the state park. It’s a good thing that we didn’t take the extra time at the beach in LA. Our destination, Gaviota State Park, turned out to be much further than we thought. The sign off of Highway 101 that we should have taken to enter the park wasn’t clear and we passed the entrance, which meant we had to continue up the steep Gaviota Pass to find a turnaround. We later learned that this pass is memorable not only for the views, but has the distinction of appearing in the movie “The Graduate” when Dustin Hoffman as the lost soul, Benjamin Braddock, drives a new Alfa Romeo through the mist and into the Gaviota Tunnel. We felt a bit like lost souls when we arrived at the park. It wasn’t a good precursor that we had noticed road signs up the pass warning of strong crosswinds in the pass. We hadn’t done our homework on this particular campground. Otherwise, we might have noticed on the California State Parks web site the phrase “high winds that often blow through the area.” High winds would be an understatement for the conditions that greeted us Friday evening. For those of you who remember our camping experience in San Angelo, Texas, when we lost a tent pole due to the wind that night, I would have to say that the winds at Gaviota were much worse than that. It was too windy to light our camp stove so we drove into nearby Buelton and ate dinner at a restaurant. We came back to the campground and sat in our car as long as possible, putting off the task of setting up the tent. But as daylight faded we couldn’t put it off any longer and got out to wrestle with the hurricane force gusts to get the tent up and anchored before it was snatched away. Lee blocked some of the wind’s force by turning the picnic table on its side and setting it next to the tent! A combination of tent tiedowns, upended picnic table and a lot of prayer saw us through the night intact with no broken tent poles. I can’t say that I got a whole lot of sleep that night, but when you don’t have to get up for work the next morning, a bit of lost sleep isn’t that big of a deal. And at some point before daylight, the wind did begin to die down. By the time the sun was up we were able to boil water for our morning tea and set up our camp chairs next to the car, blocking what was left of the wind’s force and enjoying some time in the sun. 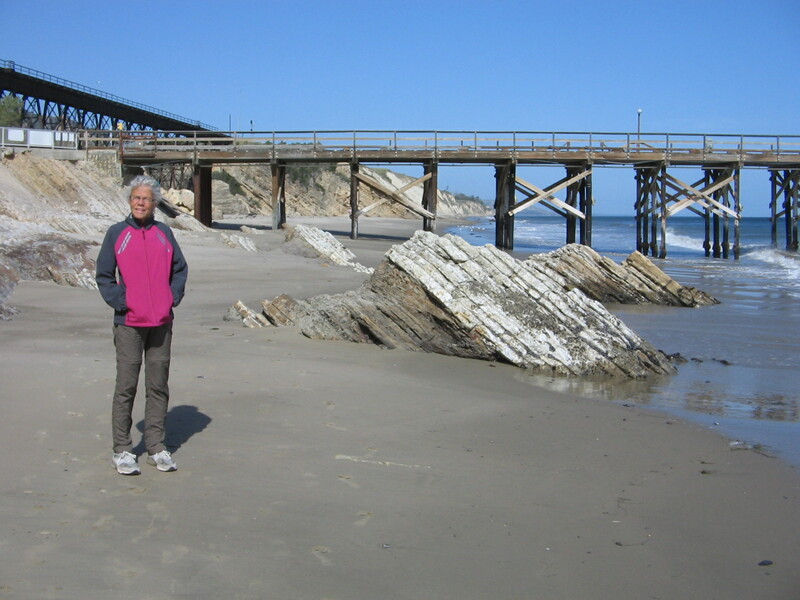 The beach at Gaviota State Park, fishing pier in the background. We saw a whale swimming near the shore around the end of the pier. 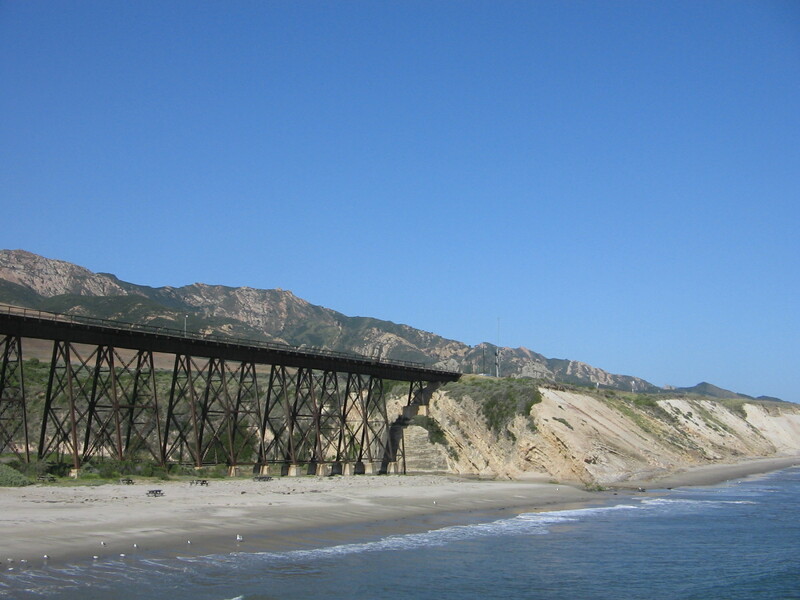 Railroad trestle at Gaviota State Park. The campground is to the left of the railroad trestle. 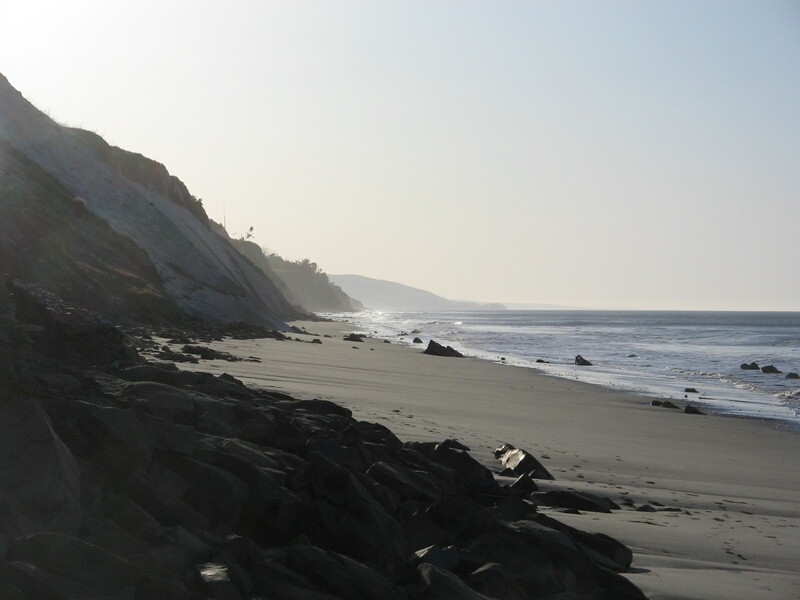 Morning view down the beach at Gaviota State Park. Our travels yesterday took us through a varied landscape as we made our way from Gaviota to Fresno, avoiding major interstates whenever possible. The highway first crossed the beautiful Santa Ynez and Sierra Madre coastal mountain ranges, green and lush with new spring growth. This gave way to the flat, desolate Carrizo Plain, marked with numerous oil wells that made me think I was back in eastern New Mexico and west Texas. Finally we reached the vast agricultural areas of the San Joaquin Valley. The climate here in Fresno is more to my tastes–dry, warm and sunny. This morning has dawned calm with no winds in sight. As we travel again towards the Sierra Nevada mountains of Kings Canyon and Sequoia National Parks, I’m sure that the weather won’t always be warm and sunny, but it’s all part of the great adventure.